Hixson community partners are joining together to recognize the month of May as “Homeless Awareness Month”. 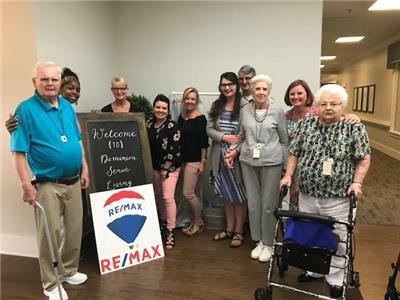 This is a collaborative effort spearheaded by two Chattanooga Chamber of Commerce member companies, Dominion Senior Living of Hixson and RE/MAX Renaissance of Hixson. A series of guest speakers will be making presentations and sharing their experiences working with the homeless population at Dominion this month. Residents will also be collecting sample sized toiletries for a local shower ministry. "Together, our community can make a difference," said Brenda Purcell, broker of RE/MAX Renaissance. Herb Hooper, coordinator of the weekly Shower Ministry at First Baptist Church at the Golden Gateway, recently estimated that some 18-20 homeless residents in Chattanooga receive weekly showers while 23-25 receive free laundry services. Mr. Hooper, a former vice-president at Chattanooga State Community College, oversees the weekly program that additionally provides 25-30 haircuts and facials by the college’s cosmetology students. He estimates about 10 percent of their customers are veterans. In addition to the shower, laundry and personal hygiene services, Mustard Tree Ministries, an inner city ministry affiliated with First Centenary Methodist Church under the leadership of Reverend Barry Kidwell, hosts a weekly dinner at First Baptist. Presently, a network of 15 area inter-denominational churches and over 100 volunteers provide a warm meal and an optional worship service on Thursday evenings. The nutritionally planned meals are prepared by the church members. It is estimated that approximately 120-160 individuals are fed at this meal. Shuttle service is provided to and from First Baptist Church by Mustard Tree. The number increases towards the end of the month as many homeless or near homeless run out of money. Some recipients receive limited monthly checks like SSI and disability but there is just not enough money to go around for the entire month. The Shower Ministry is in current need of sample sized toiletries (shampoo, lotion, soap, and deodorant) to distribute. Additionally, laundry detergent pods and dryer sheets are requested. Drop these items off at Dominion Senior Living Center of Hixson, 2143 Northpoint Blvd., or at RE/MAX Renaissance, 6402 Hixson Pike. For more information, please contact Erica Klein at RE/MAX Renaissance at 648-8200 or Brenda Purcell at 322-0011.